Companies like Foursquare and Gowalla have made the concept of smart phone users “checking in” to let their friends & family know they are in a certain location has been growing rapidly. 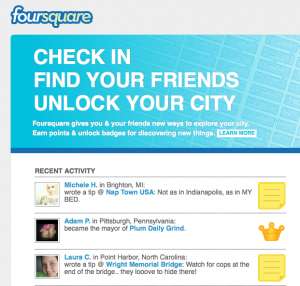 So rapidly in fact, that Foursquare recently turned down a reported $100M offer from a major Internet giant. So what gives, and how does this affect small business owners? The rise of phones with geo-location capabilities means that customers who are at your location (waiting for their drycleaning, drink, lunch, etc.) can simply push a button on their phones to announce to their Facebook friends that they are at your business. The net affect is that such customer check-ins increase the visibility of your presence in social media (without you having to lift a finger!) and also drive word of mouth traffic. 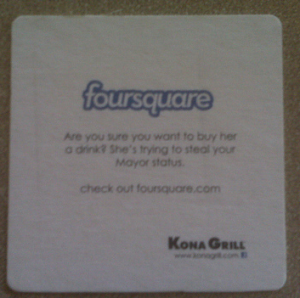 1) Check to see if your small business is located at Foursquare (currently the market share leader). Go ahead and either list your business if it’s not there, or claim your listing if it’s already in their directory. 2) Take a moment to think of promotional offers you would offer if you had the time and resources to print coupons and distribute them in the local neighborhood flyers. If such a marketing channel is applicable to you, then you can offer that same incentive on Foursquare or Gowalla – without the printing costs or paying a kid to go door to door. 3) Ask yourself – do you have customers you would love to have tell others about your business? How would you incentivize someone for doing so? $10 of free drycleaning, a free drink, a free appetizer? I have often seen the ROI (return on investment) of such promos far outweight the costs of giving such “freebies” to customers. You can do this by placing visible signs like a sticker (or drink coasters) that offer customers on the spot incentives for checking in. Photo courtesy of Foursquare HQ. Small businesses are scratching their heads trying to figure out how to spread the word about their offerings in a slumping economy, but it turns out that retailers can actually have customers do a lot of the work for them! This entry was posted in Small Business and tagged Foursquare, geo-location, Gowalla by John Sung Kim. Bookmark the permalink.